Friday for lunch I thought I would return to the new food court at the Rideau Centre. This time I had my eyes locked on MLT DWN (50 Rideau Street, Ottawa) an interesting looking grilled cheese sandwich shop new to Ottawa. This is the ownership's second store, with the other being in Kingston, Ontario, and so far seemed to be a success. Such a success even the Mayor of Ottawa, Jim Watson, has taken notice and agreed the food was delicious. @OttawaMorning @mLt_dWn I had one yesterday and it was amazing- two comfort foods pressed into one! - and by local entrepreneurs! I joined the line at 12 noon as the Rideau Centre's lunch time rush was picking up steam. The line was long, but it let me peruse the menu. The line moved slowly as one cashier gradually took orders. It was a very slow progression forward compared to MLT DWN's neighbour, Big Smoke Burger, which was moving at a steady pace. Sure there were two cash registers physically there and only one being used at MLT DWN, but this was not the issue. After debating leaving the line after a 10 minute wait of barely moving through the first length of the storefront of the 3 storefront length customer que, I figured out the issue. MLT DWN's main service issue is lack of trained staff and coordination in preparing the sandwiches. Sure they had four staff members behind the counter in the kitchen area. One was making sandwiches and another waffle fries. Another person puts the orders together at the front counter taking items from the sandwich maker and the fryer preparation area and handling the drink orders. The other staff member seems to be moving things in and out of the back. Meanwhile, there are 8 total panini style sandwich makers for the restaurant with only maximum 4 in use at any one time. With a total wait of about 30 minutes to get from the back of the line to the cash and another 10 minutes to receive your order, this has already chewed up 40 minutes of a typical one hour lunch period for the average office worker. Hopefully this melt down in service speed will be improved in the coming weeks or otherwise customers may look elsewhere to lunch options due to the extreme amount of time it takes to even order! Once my order was taken we moved down the line to watch the sandwich cook and the order put together. 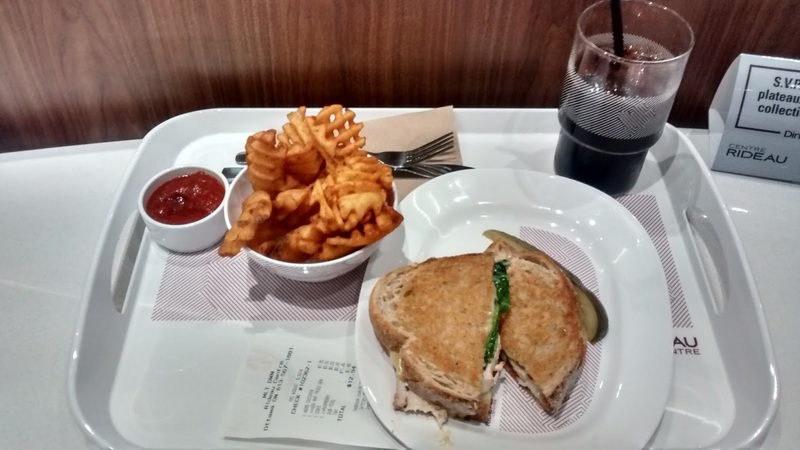 The Order: 1 Herb Chicken Sandwich with Waffle Fries and a Raspberry Coke. One of the last stops at MLT DWN's storefront counter is the condiment stand which is interesting. There are three ketchups to choose from to pair up with your waffle fries. A Pepper Ketchup, regular ketchup and another option which I can't remember at this time. I took my newly assembled order and had a seat in the busy food court. The waffle fries were an interesting take on the regular fries. MLT DWN's regular fries are waffle fries that appear to be a hybrid of a waffle and a traditional french fry or like an obese All Dressed Potato chip in stature. Taste wise by itself or with a little pepper ketchup, it's a pretty solid offering for best french fries in the Rideau Centre Food Court. Even putting to shame the newly revamped french fries from the nearby A&W. One of MLT DWN's interesting concept is the soft drinks offered. 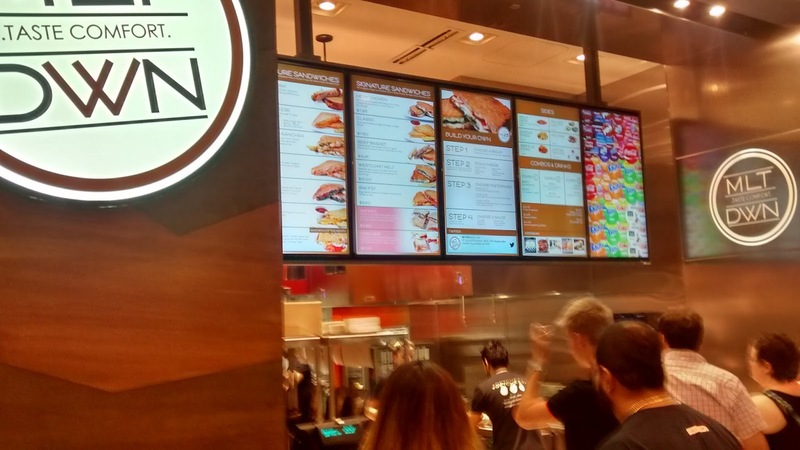 Instead of the traditional Coke, Root Beer, Sprite and other soft drinks found at A&W or McDonald's, MLT DWN offers customers different flavour additives to spice up their drinks. I chose a Raspberry Coke and was not dissapointed. In fact, I almost had a third of it before I left the storefront counter. Overall, MLT DWN serves delicious quality food. But the 30 to 40 minute wait to order and receive the food is major draw back especially when it's obvious that store staff are only using half the cooking capacity of the kitchen. Hopefully in the coming weeks more store staff can be hired and trained in order to move the line forward quicker. Otherwsie MLT DWN may have a few customer MELT DOWNs to handle.